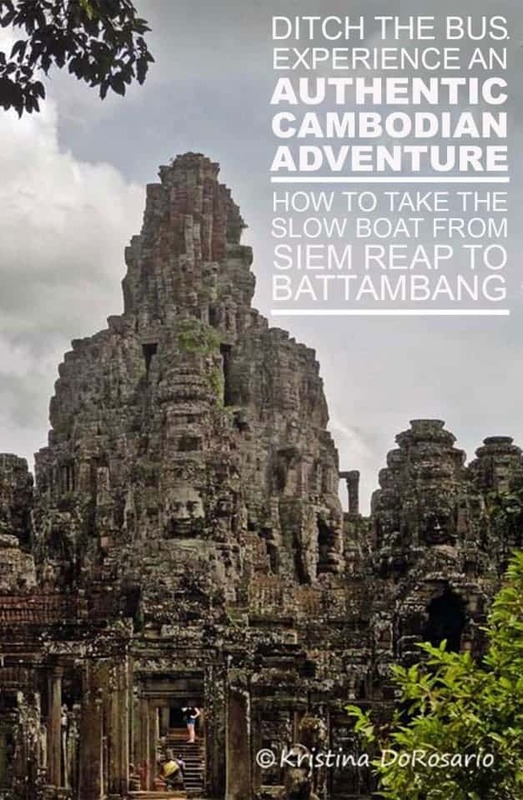 Still mystified by the ancient history of Siem Reap, where I had just spent three days temple hopping in a tuk-tuk and indulging in fine Khmer cuisine, I was eagerly awaiting my journey south to Battambang. After purchasing a boat ticket at my hostel, I, along with my oversized backpack, made my way down to the dock on a typical sweltering hot Siem Reap morning. I slithered my way to the front of the queue and began to look around for large boats or ferries, but could only see what I considered to be fisherman’s boats – shallow, long, wooden boats. One of these boats pulled up in front of me, and a couple of men jumped out to anchor it to the dock. Once it was secure, they ushered me over. I politely waved them away, while pointing to my ticket for the boat to Battambang. They persistently ushered me over. I moved forward with uncertainty to show them my ticket, but before I could ask, they had checked it and stamped it, while assuring me that it was, in fact, the boat to Battambang. As confusion set in, the man checking tickets grabbed my backpack, hoisted it over his shoulder and flung it onto the roof of the boat while directing me to find a seat. I found a wooden platform with a great view of the river from the back of the boat, so I hopped up and made myself comfortable. A few minutes later, I heard a loud roar and felt a giant rumble beneath me. It was the engine. Of all the places to sit, I had chosen the engine. My body shook as the engine revved several times when I noticed a couple of “crew members” jump into the water from the dock, one with a giant bamboo stick in hand. Apparently, the propellers had become tangled in the river vegetation. 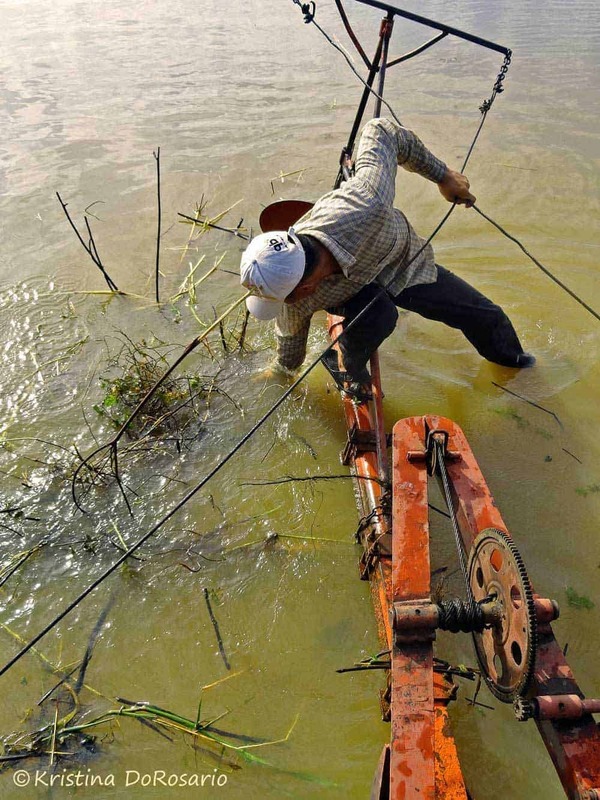 One crew member managed to rip the plants off of the propellers while another gave the boat a forceful push by lodging the bamboo stick into the soil to put the boat in motion. A couple of hours had past, and we began to thread through the tight twists and turns of the Sangkar River – something I couldn’t quite understand the physics of, given that our boat was so long. To no surprise, our boat came to an abrupt stop while attempting to make a turn. I saw a couple of crew members run to the front of the boat with their trusty bamboo sticks. Luckily, we had our trusty crew members with bamboo sticks, who were able to push the boat away from the tree and back onto its original path. My attention was quickly diverted when I spotted a house. This wasn’t any old house, however. 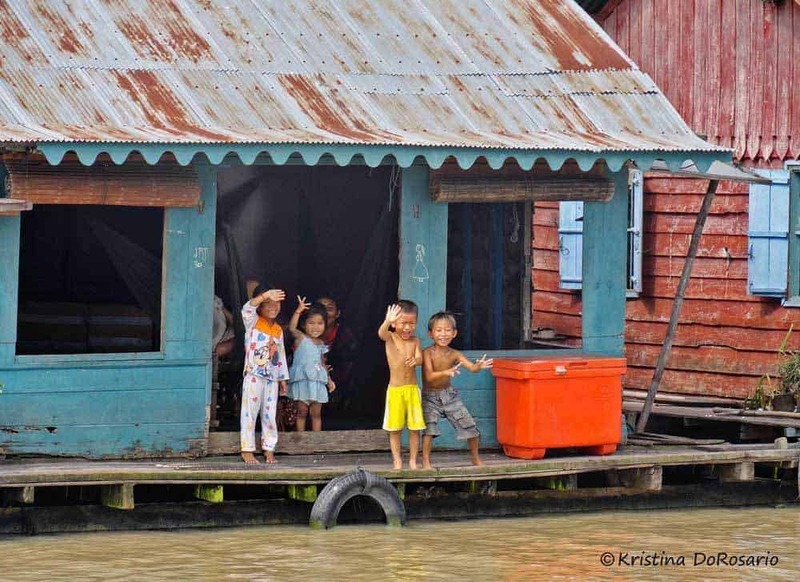 It was a house that was floating in the water, which was my first sign that we had just entered a Floating Village. 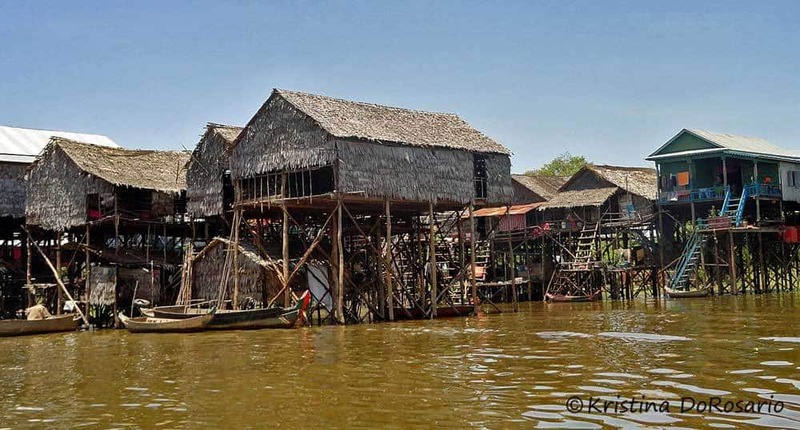 While some houses were mounted on giant planks of floating wood, others sat atop a quadrangle of tall wooden logs, raising the home one storey above the water. I was awestruck. 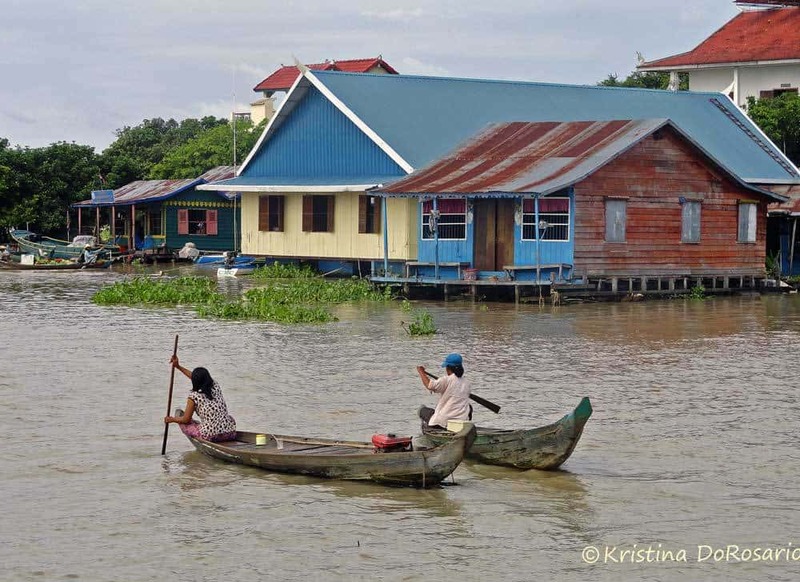 These homes were floating, unattached to each other, in the river, where they only mode of transport was a rowboat…or swimming, for the ambitious folk! Cue that mesmerizing moment that every world traveller has – the epiphany that occurs when experiencing a culture so different from their own. The curiosity inside me was building as I wondered about the logistics involved in facilitating life in a floating village. It was truly a sight to see. Though no dry land to rely on, there was certainly no shortage of the essentials – vendors in rowboats offering fresh produce, food, and gasoline, floated alongside the children frolicking in the water, while parents looked on from their front porch. We floated through the villages for several hours, and I was captivated the entire time, as I shot hundreds of photos. I was overcome with a feeling of satisfaction in my choice to ride the boat instead of the bus while reflecting upon the eventful journey I was having. I would strongly recommend the Slow Boat to anyone travelling this route – you won’t be disappointed! Cultural Experience Little to none Priceless! If you want to catch some rays, you can just climb onto the roof of the boat and bask in the sun…one might think this would be prohibited due to passenger safety, but anything goes on the Slow Boat! It’s one of the best ways to understand life in a Floating Village, unlike the villages that are frequented by scheduled tour boats. 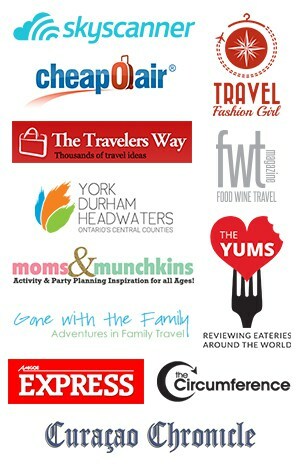 Kristina DoRosario is a travel blogger and freelance travel writer from Toronto. As an avid solo traveller with an intense curiosity for foreign cultures, she is always anticipating her next adventure. 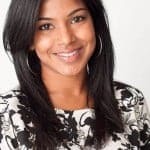 Kristina covers everything from destination reviews to personal travel narratives and believes that the best travel advice is based on personal experience. 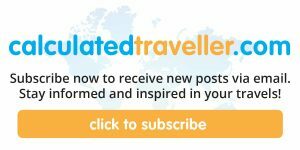 As a food addict, athlete, and former expat, Kristina satisfies her passion for travel by writing unique and authentic stories from her adventures abroad. Was in Cambodia last month and took this boat. Indeed it was a pleasurable experience. Especially loved the journey over the wide open waters and the last hour on Songkae River before arriving in Battambang. Loved your story. You’re right – this experience looks priceless… We’d go for gliding past those floating villages over the bus ride. (It would probably help to sit on a jacket for some cushioning though :-). Wow! This is so cool. What an experience, and those kids are so darn cute!